In a May 2014 Twocare.org special report, I delved into the history of a little known early 1990s U.S. evangelical campaign in which American evangelicals and fundamentalists carried out the religious indoctrination of millions of public school students in Russia, in former Soviet Union territory, and in former Eastern European Soviet ally nations. These American evangelicals were, of course, vehemently opposed to LGBT rights, and one of the leading organizations behind the effort, Campus Crusade For Christ, would later be exposed by Truth Wins Out for its effort to disseminate anti-gay propaganda across an entire continent, in Africa. But when I wrote that Twocare.org report I was unaware that there were direct ties between leaders of the emerging, dominionist “apostolic and prophetic” movement (now commonly referred to as the New Apostolic Reformation) and the campaign to evangelize Russia which ramped up with the collapse of the former Soviet Union. Now, thanks to video posted by Rick Joyner’s Morningstar Ministries, we have some information on those ties. While Twocare.org has previously investigated at length the funding behind such US-based anti-LGBT efforts as the World Congress of Families, this report delves into the movement background of evangelists such as Bob Weiner, Mike Bickle (pictured), Rick Joyner, and their New Apostolic Reformation movement fellows working to export the NAR’s dominionist style of Christian supremacy to Russia and the world. In an April 9, 2015 appearance at the Fort Mill, South Carolina ministry of Rick Joyner, evangelist Dr. Terry Law described how, in 1991, “Bob Weiner called me and said, ‘would you talk to a group of pastors in Dallas, about Russia, and what God is doing there ?” As Terry Law recounted, one of the pastors in Dallas was Mike Bickle, who then invited Law to speak at an appearance at Bickle’s Kansas City, MO Kansas City Fellowship church. At the Kansas City Fellowship, recalled Terry Law, he spoke before five or six thousand people about the “open door” to Russia. To accept “the offering” after Law’s talk, Bickle’s Fellowship pastors brought out three sixteen foot tables for all the expected cash. “They were all packing guns”, reminisced Law. $1,150,000 was the final take which, according to Terry Law, allowed him to distribute 5 million bibles in Russia. First, let’s look at Morningstar head and founder Rick Joyner (who was one of the members of the controversial “Kansas City Prophets” described later in this article). Joyner has long been a dedicated cheerleader for the authoritarian rule of Russian president Vladimir Putin. In a 2002 “prophetic bulletin”, Joyner declared, “God’s grace is extended toward Russia, and He is the One who put in Putin.” As described in the report linked below, Joyner has cultivated ties to top Putin allies such as head of the Russian railway system Vladimir Yakunin. He even even claims to have personally met members of Putin’s nuclear family. And, Rick Joyner – who in 2013 issued a call for the “military takeover” of the United States (see the Twocare.org report U.S. Pro-Coup Evangelicals Ally With Putin Inner Circle), is openly on record stating his prophetic vision for the imposition of theocratic or theonomic (government by biblical law) rule that would “at first seem like totalitarianism”. Next, Bob Weiner. Here, some background is in order: Bob Weiner, who in the 2000s became one of the dues-paying apostles in the International Coalition of Apostles (which was during the first decade of the new millennium headed by church growth expert C. Peter Wagner), was also the founder of the 1980s cultic, authoritarian Maranatha Ministries. In the early 1980s, many local Maranatha chapters were kicked off college campuses amidst rising controversy over the authoritarian and abusive practices of Weiner’s Maranatha. In an effort to clear the name of his ministry, Weiner asked the conservative evangelical Christian Research Institute, a watchdog group that monitors Christian cults, to endorse Weiner’s organization. But a subsequent CRI investigation led, instead to a scathing public CRI condemnation of Maranatha, which in 1989 was officially disbanded. Former Maranatha leaders then launched spinoff ministries, under new names – notable Morningstar International and Every Nation, that capitalized on the the international networks and sprawling global empire of churches Bob Weiner had launched. Maranatha’s politics were decidedly right-wing, to the point of hysteria; during the early 1980s when the covertly U.S.-backed “Contras” were conducting a campaign of terrorism and sabotage against the socialist Sandanista regime of Nicaragua, Bob Weiner instructed his Maranatha leaders to organize pro-Contra rallies on college campuses, and Maranatha distributed literature that offered, to financial contributors, spent shell casings from bullets fired by the Contras. Weiner’s group also warned of the danger of a Soviet amphibious invasion of the mainland U.S.
For his part, Bob Weiner was one of founding members of the 1980s evangelical political front known as the Coalition on Revival which, under the intellectual shepherding of top leaders of the theocratic Christian Reconstructionist movement, hammered out frameworks for the imposition of biblical law and the “biblical worldview” in all spheres of society. Through COR, Weiner was in forefront of an effort that drew previously apolitical charismatic evangelicals, as well as anti-charismatic fundamentalists, into politics. And, COR provided a framework for the two camps – which had long been separated by clashing eschatologies (beliefs on what would happen during the end of history alluded to in the Bible’s book of Revelations), to work together towards a common goal. COR also divided into the Pre-Millennialists and the Post-Millennialists. The Pre-Millennial Dispensationalists were the theological camp that expected the coming of the Tribulation, which would precede the “Rapture” of true believers into heaven – after which an apocalyptic conflict between Christ and Satan would lead to the establishment of a Christ-ruled millennial kingdom on Earth. The Pre-Millennial camp, which encompassed both charismatic and non-charismatic tendencies, tended to view earthly and secular institutions as irredeemably corrupt. Thus, they tended to avoid political engagement. As described in the book Christian Jihad: Neo-Fundamentalists and the Polarization of America by former COR participant Colonel V. Doner (2012, Samizdat Creative), the Coalition on Revival was a truly radical effort, in which participants pledged a “blood oath”, to give their lives if necessary, in their quiet, mostly covert, campaign to implement the COR agenda. COR’s original leadership included top evangelicals such as Robert Dugan, Director of Public Affairs for the National Association of Evangelicals, leaders from Campus Crusade For Christ, and Vice President of World Vision Ted Engstrom. While Campus Crusade founder and head Bill Bright was careful to officially keep his name out of COR, he nonetheless is reported to have given a keynote speech at the 1986 launch of the COR manifesto. Bright, in turn, worked closely with Billy Graham, one of the top leaders of the elite group known as The Family, or The Fellowship, that sponsors the National Prayer Breakfast. Thus was the COR effort strategically connected to the highest realms of politicized conservative evangelicalism. Among the evangelicals involved in COR were a number of charismatics, including Bob Weiner, who would in the late 1980s to 1990s begin to establish official organizations aimed at a global reunification of Christianity under the banner of a second Reformation. COR participant C. Peter Wagner would, in the first decade of the new millennium, head a number of the key leadership groups in this effort, notable the International Coalition of Apostles – probably the biggest apostolic group in the emerging NAR, and the Apostolic Council of Prophetic Elders, who two dozen-odd prophets are empowered to receive, directly from God, revelation which can have the force of biblical scripture. Also in the original COR steering committee along with Bob Weiner was Dennis Peacocke. Both men were significant figures in what is known as the Discipleship/Shepherding Movement under which Shepherding leaders took what was often draconian and abusive control over the lives of believers, to the point of dictating basic life choices such as employment and sexual relationship decisions. Shepherding mirrored the authoritarian control over the lives of disciples that has traditionally been part of certain Eastern religious traditions. In the 1970s, the rise of the Discipleship/Shepherding movement provoked acrimonious controversy and drew a public rebuke from rising evangelical star Pat Robertson, after which some of the movement’s leading American proponents publicly disavowed its methods. In practice, however, Discipleship/Shepherding merely toned down some of its worst excesses and went underground; and its underlying ethic, that disciples are to pattern their lives after the lives and dictates of their chosen “shepherds”, can be seen in global networks such as the sprawling franchise launched from the Kansas City, MO International House of Prayer, whose young “House of Prayer” acolytes can be seen, in footage taken at local HOPs in cities across America, speaking and worshiping in cadences and with vocabulary that show an eerily close resemblance to the speech patterns and language of top IHOP leaders, notably Mike Bickle and Lou Engle – both of whom are top prophets in the international New Apostolic Reformation movement. In the 2000s, Bob Weiner reestablished a ministry at Harvard University. It is part of a much larger effort that has ramped up over the last decade, flush with millions in funding from the National Christian Foundation, that targets students at the schools of the elite Ivy League. Part of that targeted evangelizing effort are the myriad “Houses of Prayer” that have been spun off Mike Bickle’s Kansas City International House of Prayer. Bickle got his start as a top leader in the controversial 1980s group known as the “Kansas City Prophets” that pioneered many of the charismatic doctrines and practices which have congealed into the New Apostolic Reformation movement and its rapidly proliferating international constellation of apostolic and prophetic organizations. In the late 1980s, the charismatic Kansas City pastor Ernie Gruen authored the 233-page report, Aberrant Practices that sharply criticized the freewheeling “prophetic” practices of Mike Bickle and the Kansas City Fellowship and exposed apparent, wholesale KFC invention of new end-time doctrine, in which Bickle’s Fellowship was to be the launching pad for a global movement of supernaturally empowered young believers, a “new breed”, who would cleanse the earth of evil. Many Kansas City Fellowship teachings criticized in Gruen’s report closely tracked the wildly controversial 1950s movement known as Latter Rain, that emerged in 1948 from a Pentecostal revival in the Canadian province of Saskatchewan. Like the Discipleship/Shepherding movement, Latter Rain was sharply denounced by charismatic denominations such as the Pentecostal Assemblies of God, which has over the decades issued several official edicts denouncing the more characteristic Latter Rain practices, such as the issuing of prophecy relating to the lives of specific individuals and the transfer of “spiritual gifts” through the laying on of hands. 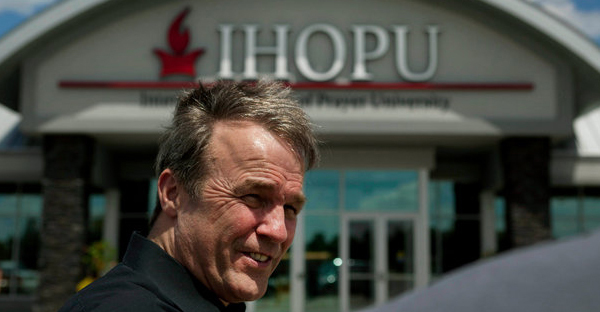 Through the creation of the now flourishing (though still heavily controversial) IHOP, Mike Bickle and his fellow IHOP board member Lou Engle (founder and head of the closely related organization TheCall) have begun to implement Bickle’s grand prophetic vision – and through the IHOP movement’s strategic convergence with now-allied international efforts such as Campus Crusade For Christ, Youth With a Mission, and Luis Bush’s Transform-World franchise, Bickle and Engle – along with their NAR movement allies such as Bob Weiner and Dennis Peacocke, now have means to export their ideas and practices to all nations of the Earth. As a background process, the global Lausanne movement, launched in the early 1970s by Billy Graham as a counterweight to the (allegedly socialist-leaning) World Council of Churches, further aids the process. As a movement, the New Apostolic Reformation and related tendencies within dominionist Christianity (such as Christian Reconstructionism) exemplify what I have come to call “covert Christianity”; these movements, because they have originated as minority tendencies and because their cultic practices and “aberrant” ideas are highly controversial, advance by stealth – through incremental ideological infiltration, by setting up parallel networks that can eventually replace established church structures (such as traditional Protestant denominations), by working to loft specific “believers” to positions of power and influence atop the so-called “7 Mountains” (seven key sectors of society: government, business, media, education, arts and entertainment, religion, and the family), and other covert methods. The Lausanne movement, though hardly by design, established working relationship, protocols for collaboration, and shared theological common ground among the many thousands of Protestant denominations worldwide. But in doing so, Lausanne also inadvertently paved the way for innovators who could capitalize on Lausanne’s global networks to spread radical new innovations in the faith. Thus, Lausanne has become a force multiplier for such radical innovators as Rick Warren (a student of C. Peter Wagner’s and whose church Wagner identifies as part of the NAR movement). Warren’s “church-in-box” franchise approach, that the Purpose-Driven megapastor is rapidly exporting to Africa, draws for inspiration upon the corporate methods of Intel and McDonald’s, and also from the research of C. Peter Wagner and his fellow “church growth” specialists from Fuller Theological Seminary and its School of World Mission, who have helped create Warren and Wagner’s new syncretic form of Christianity, that is cobbled together through the heuristic appropriation from churches and movements across the globe within Christianity and also (some would argue) non-Christian traditions, of theological ideas, and practices proven to grow churches, make converts, and expand “The Kingdom”. In the end the Lausanne movement – which started as an effort to preserve orthodoxy and defend conservative evangelicalism, may lead to something wholly different, a new and strangely different form of Christianity which arguably bears as much resemblance to traditional Christianity as does Mormonism, but which is far less willing to coexist with pluralism and democracy.